Egypt (Arabic: مِصر‎‎) is a large country located in north-eastern Africa (except for the Sinai Peninsula, which is located in Asia). Egypt borders Libya to the west, the Gaza Strip and Israel to the east, and Sudan to the south. Egypt has coastlines in the Mediterranean Sea and the Red Sea. With a covering area of 386,662 mi2, Egypt has about the same land covering as Texas (a state in the United States of America). 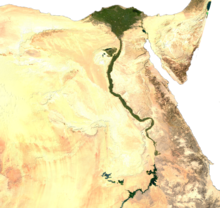 The Nile River, the longest river in the world, goes through the cities of Alexandria, Cairo, Luxor, and Aswan (all in Egypt), as well as Sudan, South Sudan, Uganda, and Ethiopia. The Nile River is a major source of water for Egypt and Sudan. Egypt has a history stretching back thousands of years, starting from Ancient Egypt. Around 82 million people live in Egypt, mostly in the areas around the River Nile. Most of the people in Egypt speak Egyptian Arabic. Also see the Wikijunior:Countries A-Z/Egypt book. This page was last edited on 27 November 2017, at 13:21.